First used during World War II to make airplane propellers, laminated veneer lumber (LVL) has been available as a construction product since the mid-1970s. LVL is the most widely used structural composite lumber (SCL) product and provides attributes such as high strength, high stiffness and dimensional stability. The manufacturing process of LVL enables large members to be made from relatively small trees, providing efficient utilization of forest resources. LVL is commonly fabricated using wood species such as Douglas fir, Larch, Southern yellow pine and Poplar. LVL is used primarily as structural framing for residential and commercial construction. Common applications of LVL in construction include headers and beams, hip and valley rafters, scaffold planking, and the flange material for prefabricated wood I-joists. LVL can also been used in roadway sign posts and as truck bed decking. LVL is made of dried and graded wood veneer which is coated with a waterproof phenol-formaldehyde resin adhesive, assembled in an arranged pattern, and formed into billets by curing in a heated press. The LVL billet is then sawn to desired dimensions depending on the end use application. The grain of each layer of veneer runs in the same (long) direction with the result that LVL is able to be loaded on its short edge (strong axis) as a beam or on its wide face (weak axis) as a plank. 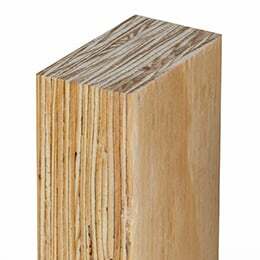 This type of lamination is called parallel-lamination and produces a material with greater uniformity and predictability than engineered wood products fabricated using cross-lamination, such as plywood. LVL is a solid, highly predictable, uniform lumber product due to the fact that natural defects such as knots, slope of grain and splits have been dispersed throughout the material or have been removed altogether during the manufacturing process. The most common thickness of LVL is 45 mm (1-3/4 in), from which wider beams can be easily constructed by fastening multiple LVL plies together on site. LVL can also be manufactured in thicknesses from 19 mm (3/4 in) to 178 mm (7 in). Commonly used LVL beam depths are 241 mm (9-1/2 in), 302 mm (11-7/8 in), 356 mm (14 in), 406 mm (16 in), 476 mm (18-3/4 in) and 606 mm (23-7/8 in). Other widths and depths might also be available from specific manufacturers. LVL is available in lengths up to 24.4 m (80 ft), while more common lengths are 14.6 m (48 ft), 17 m (56 ft), 18.3 m (60 ft) and 20.1 m (66 ft). LVL can easily be cut to length at the jobsite. All special cutting, notching or drilling should be done in accordance with manufacturer’s recommendations. LVL is a wood-based product with similar fire performance to a comparably sized solid sawn lumber or glued-laminated beam. Manufacturer’s catalogues and evaluation reports are the primary sources of information for design, typical installation details and performance characteristics. LVL is mainly used as a structural element, most often in concealed spaces where appearance is not important. Finished or architectural grade appearance is available from some manufacturers, usually at an additional cost. However, when it is desired to use LVL in applications where appearance is important, common wood finishing techniques can be used to accent grain and to protect the wood surface. In finished appearance, LVL resembles plywood or lumber on the wide face. As with any other wood product, LVL should be protected from the weather during jobsite storage and after installation. Wrapping of the product for shipment to the job site is important in providing moisture protection. End and edge sealing of the product will enhance its resistance to moisture penetration. LVL is a proprietary product and therefore, the specific engineering properties and sizes are unique to each manufacturer. Thus, LVL does not have a common standard of production and common design values. Design values are derived from test results analysed in accordance with CSA O86 and ASTM D5456 and the design values are reviewed and approved by the Canadian Construction Materials Centre (CCMC). Products meeting the CCMC guidelines receive an Evaluation Number and Evaluation Report that includes the specified design strengths, which are subsequently listed in CCMC’s Registry of Product Evaluations. The manufacturer’s name or product identification and the stress grade is marked on the material at various intervals, but due to end cutting it may not be present on every piece.